In June 2016, Real Gone received an email from the press office dealing with the UK promotion of the release. We politely explained that we would not be reviewing the album due to our offence at the choice of title. It was suggested that since we felt strongly about this, maybe we should put together a thoughtful piece explaining why. We had already planned on doing so…and so, an article explaining why we couldn’t support the new album – even as huge fans – was posted online on July 1st. Our position was very clear: we were boycotting. There would be no review or conventional plugging of this record. A couple of weeks passed. We got a message asking us to phone the PR company as soon as possible. In several years of being online, this had never happened before. Something was definitely afoot. What? This was news to us. What online petition, exactly? Apparently, various emails had been flying back and forth and the band were aghast – they didn’t really see why the album title would be seen this way in Britain. A long conversation ensued. The guy said that he was into free speech and couldn’t really be seen telling the band what they shouldn’t say, subsequently ignoring the fact that free speech didn’t necessarily give middle aged white men any right to use words that are offensive to minority groups. He also referred to disabled people as “the underprivileged” at one point, suggesting that – much like the band he’s been asked to plug – he isn’t always so hot when it comes to dealing with disability issues either. It turned out, we think, that the PR company were hoping they could ask us nicely to take down the petition. However, it wasn’t our place to do so; the word was out and other people were justifiably just as angry at Descendents’ choice of words. Had the petition been ours, would we have removed it? No, absolutely not. The originators of that petition, Stay Up Late, a charity organization campaigning for disabled people – focusing very much on understanding, inclusion and fighting against outdated slang terms – were understandably very angry. So were their supporters – including other disability campaigners and charities, not only in the UK but also farther afield into Europe and Australia. Punk fans and musicians in the UK joined them in their crusade against the offending word. Whilst at this point it was far too late to make Descendents and their label Epitaph Records change the album title, it was very much felt we could at least make people think about the hurt that such words cause. In the UK, people very much understood. In the US, not so much. A couple of musicians understood but, by and large, the disability message was lost. “It’s the same as nerd” is something we’ve been told repeatedly, without even the faintest sparkle of knowledge or even irony. Americans also tried to cloud the issue by telling us that if we’re going to boycott Descendents for hate language against minority groups, then we should be consistent and get angry at Patti Smith for racist words, avoid Devo and ban all records by The Queers. The point missed there is that the Descendents’ album is now – 2016 – while those other things, including Joe King’s choice of thoughtless band name, date back some thirty years or more. It doesn’t make them right; but there’s the rub – we have to look at the past and learn from it. On the surface, Descendents appeared not to have learnt anything, still using such language as if it were 1983. Looking at the big picture, that’s just a microcosm of an American attitude – an attitude that never once bothered to ask their disabled citizens whether they were offended by the use of sp*z – always a derogatory term. In fact, Descendents fans’ retaliation against us from across the Atlantic reached scary levels. Real Gone received abuse, most of which was fielded back with a witty retort. However, we even had some of our favourite American musicians use our upset of sp*z as casual language against us: first telling us to grow up, then belittling our thoughts as coming from “some moron” before further suggesting this wasn’t worth “sp*zzing out about”. Really, lads? Is your level of understanding that poor? Friends asked us to name and shame. We didn’t have to: members of the The Connection came and named themselves like it was some kind of badge of honour to bash a petition calling for Cerebral Palsy understanding…all before repeatedly using the s-word on a disabled fan’s Facebook timeline against her, in an effort to upset and offend. She is, understandably, mortified. It’s “punk”, apparently, according to them. No it’s not: it’s the actions of bullies with herd mentality and it’s totally unacceptable. Stay Up Late received even more abuse. In fact, most of the US based Descendents fans who reacted came across as utter bellends, incapable of discussion without name calling or some good old fashioned safety in numbers bullying. Everyone associated with speaking out against the word “sp*z” were verbally attacked by all kinds of anti-disability slang, worse by the day. Even after having everything explained clearly regarding the word sp*z and its connection with Cerebral Palsy, someone suggested that it was just “made up to get attention”, before other Descendents fans went about their business suggesting that the word just meant “someone who was good at computers” and how the Descendents album title just meant “someone sp*zzed out on coffee”. Jesus Christ, let’s hear it for true disability ignorance! One slightly more helpful fan pointed out that the offending title refers to a song on the album that speaks out against giving kids with ADHD suppressing drugs. No prizes for guessing which word Descendents use in that song to label those kids… While the message within the song aims to raise awareness of our differences, surely they could have chosen their words more wisely? Anyway…the ongoing abuse has not just been restricted to name calling either. One Descendents fan threatened the Stay Up Late founder with actual physical violence. Other fans sabotaged the petition and also repeatedly tried to compromise the Stay Up Late website. That’s lowered the bar for intelligence – hurting a charity website because they’ve spoken out about your favourite band’s actions. How loathsome. The charity have other campaigns on their hands too, and you’ve potentially damaged those. We hope you’re proud of your efforts, American “punks”. Over the past month, lots of Descendents fans have shown their true colours; the ugly colours of ignorance, often spouting disability hate. Supposedly, Milo, Stephen, Karl and Bill are wonderful people who would never set out to deliberately hurt anyone. Their US fans paint a very different picture. In summary – or somery, as Descendents would surely prefer – it’s been a publicity mess. A mess caused by thought processes of fifty year olds who still think it’s fine to approach language as if they were twelve, let’s not forget. Between them, these men have exposed further the lack of disability education within the US in 2016. 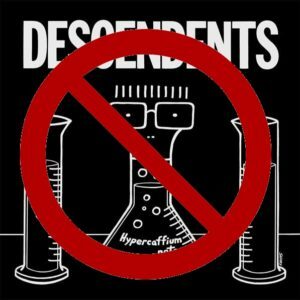 The Descendents, meanwhile, are in the UK promoting ‘Hypercaffium’ in August 2016 as part of the annual Rebellion Festival in Blackpool. Their current t-shirts will suggest it’s okay to share offensive disability hate speech, some of their fans might even wear them. You may even be unlucky enough to catch sight of a poster or two. Luckily, many UK fans know this is wrong, but it doesn’t change the fact this should never have happened at all. As massive fans of Descendents at Real Gone, this has been a very upsetting experience. It’s going to be a long time before the wounds genuinely heal. There’s every chance that our love for the band – a love and support that dates back decades – may never really return. On the positive side, we hope it’s at least begun to awaken a sense of awareness within those who never thought about (dis)ablist language before. All the while there are musicians out there using their art for positive messages [as detailed in this brilliant article from Skin Back Alley], there’s hope. This entry was posted in Miscellaneous and tagged descendents, disability slur, hypercaffium, milo aukerman, stay up late, the connection by Real Gone. Bookmark the permalink.